Can you tell us a bit about yourself, Jeane? Sure, my name is Jeané Sunseri-Warp. I am 36 years old, mom of two and happily married to an amazing man who is my biggest supporter and does anything to help me succeed. I work as a Program & Change Manager for Cisco in Silicon Valley and am someone who is very dedicated to fitness. Formerly, I was a competitive bodybuilder but now my main focus has been on beach soccer and even more recently on futsal. 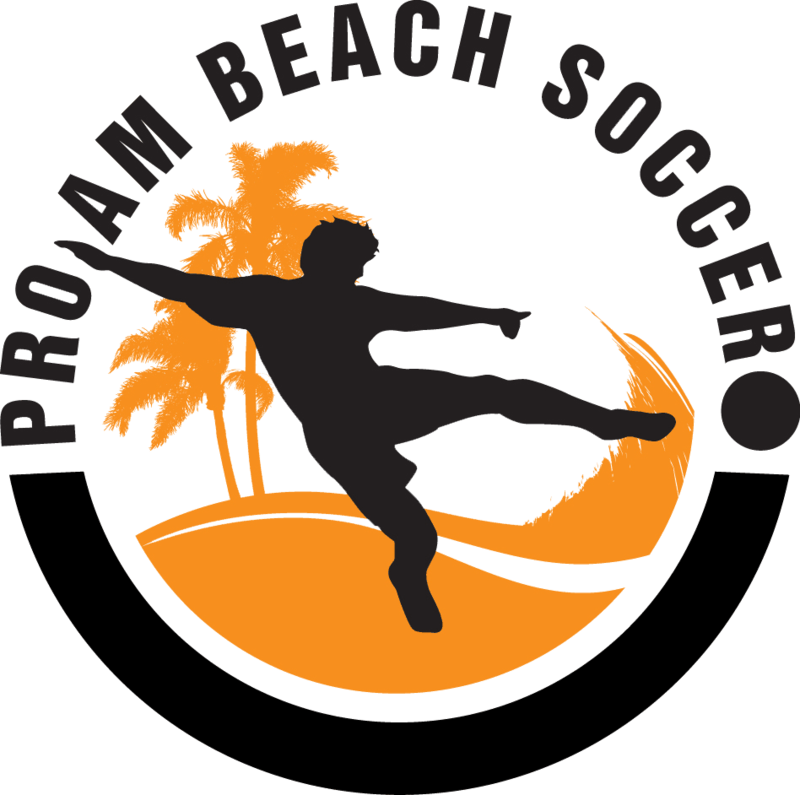 You mention in your testimonial for Pro-Am Beach Soccer a teammate of yours randomly asked you to play in a beach soccer tournament. Can you tell us who the player was and when your first tournament was? The teammate who introduced me to beach soccer was Luisa Meza. The event was the Santa Cruz Open in 2017. 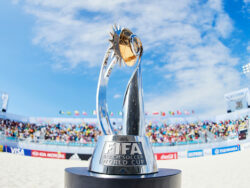 What can you tell us about your experience of playing beach soccer for the first time? Honestly, I did not think much of it besides going out and having a good time. But, when I arrived and played, I did not expect it was what it was. I am someone who is always up for new challenges and enjoys pushing myself, but this was something altogether more than I could have ever imagined. I thrive on playing in the air and would attempt things on the grass, but this first exposure allowed me to do it throughout the event without much concern since I was landing on a soft surface. I found myself able to get a bit more creative. That being said, it also pushed me more than I could remember. This also was around the same time I was introduced to the director of the event and the coach of the NorCal Men’s team, Tighe O’Sullivan. He had already been in touch with “Meza” with the desire to introduce a NorCal women’s team for an event in Trinidad & Tobago which he later pitched to us at an event in Long Beach. I was all in at that moment, but I really didn’t know what that meant. Well, I am someone who is really dedicated to fitness and I believe I have a very high level of discipline. When we went to Long Beach and played, I really discovered I didn’t really know what I was doing. I recall Tighe speaking to us about how to lift, pass, and his moniker “running in high heels” as a way to think about running in sand. Essentially, we realized there was a lot more going on than just kicking a ball in the sand and having fun. We ended up losing in the Semi-Final, and that’s pretty much when it hit Meza and I as we walked away feeling like we were unfit and not prepared. At that point, we decided, if we are going to do this then we have to do it. That started us both down a path and journey with NorCal which then led to a world of opportunities for us. How long did it take you to feel you reached an internationally competitive level? Tobago in 2017 is when I had the first taste of the competition level. Facing off on two occasions against a player from Mexico and many of the players from Portsmouth, who was part of the English National team mind you, and current European Champions for women. They were playing with Shoreline from southern California and it was an eye-opening occasion, which made everyone playing for NorCal, men included, very excited. Our coach was teaching us on the fly as many of our players had only been training for weeks prior to this event. Many of us were still struggling to simply lift the ball and play through the air. The experienced internationals showed us how swiftly they moved in the sand and skills we did not see often in all our years playing on the grass. What has your experience been training and playing with NorCal BSC since then? It has been a journey. It was a completely new challenge and our coach just kept reiterating this was just the beginning yet we were not very far behind. I knew I could get to the level and now with this experience, the path our coach spoke of was much clearer to understand. We simply didn’t have a measuring stick and now we do. We have a great group of ladies who are open and selfless in sharing what we have all learned and training with them has been a gift. Without my teammates, the training would not have been the same. We push each other, and it gave me the chance to have a positive environment where we are always giving and learning and willing to share. We have built such a unique space for that. You mentioned having the chance to play with Sporting CP. Everyone knows the green and white of this legendary Portuguese club, but what was it like to play with a truly professional club led by the legendary Portuguese marksman Madjer Saraiva? No words, blown away…surpassed any level of expectation of professionalism I have ever seen or could have possibly imagined. What started as a smidge of a dream Meza threw at me, turned into the best experience in my athletic career thus far. Madjer Saraiva was the director of beach soccer, as well as a player for the men’s Sporting team. Everything was very structured, and all the players on both the men and women’s sides had great respect for each other. We had two coaches on the sidelines, two physios. and stands full of Sporting fans waving the flag. Madjer has taught me so much as it was a very different style from what I was doing with NorCal which had me moving into the attack more. I vividly remember his voice yelling instructions at me to stay home and anchor the back. He treated the teams like family. The men and women’s teams would have team meetings together, meals together, it was truly a unity. Being in a club like that exposed Meza and me to things you just don’t find in the US. We have structured physio time for acupuncture, cupping, icing, protein intake if needed, as well as prep time for games, video analysis, as well as personal time for mentally preparing yourself for matches. Access to this was something I had never thought I would ever have the chance to experience. How has this affected you and also your teammates at NorCal which you have now shared it with? Motivated. Humbled. Luisa Meza and I still shake our heads at that experience still in shock that we did that. But so excited and eager for what’s to come. We are all not very far from all playing at this level. I see it every time our girls get together as we continue to improve. We have players who could truly compete now at the international level playing the game properly compared to 18 months ago. A year ago, most of us couldn’t even set ourselves up for a bike kick and now we all pretty much can. Even if we can’t we train enough and compete against each other pushing us to get better and better. I will never forget the day Luisa Meza asked me to play beach soccer, and our journey the both of us took to Portugal for the EWC, and then back again to Portugal a second time but that time taking another phenomenal teammate Gabby Batmani. Not to forget the opportunity Paxton Scott, another teammate of ours, had to play for Portsmouth in the EWC. It just goes to show, the hard work, the hours of training, allowing yourself to take in feedback to help correct your game truly does play a factor in this whole story. How many days a week do you train? How many of those days are beach specific? At this time, coming out of winter, and with the possibility of the US Women’s National Team on the horizon as an option, I am going 6-7 days a week, and 2-3 days a week are double days. The double days I start with an OTF (Orange Theory Fitness) which is high-intensity interval training. The beach training is 2-3 times per week in addition to my workout regime. I work out at the Orange Theory Fitness Communication Hill studio in San Jose and have enjoyed amazing support from them to achieve my goals. How have you been able to pull all this off? Husband, two kids, and working at a major company like Cisco? Did I mention my husband is amazing? My kids are just great kids who go with the flow and have fun all along the way. My family, in general, has given me the support and absolutely love the people within our culture. All my teammates love my family, and even in Portugal, my husband was adored by my teammates. As for my job at Cisco, they are an amazing company which really has prided itself on trying to find work/life balance. They have been very supportive of my goals and have allowed me to work remotely. I know everyone does not have this sort of opportunity, so I have done everything I can to take advantage of the life which has presented to me and to live it to the fullest. If I was working a normal 9-5 job I would make it work, but it would not be the same and I am sure more complicated. It has given me the mindset of not settling and the desire of needing to grow and learn. I am grateful for my situation and grateful for those that have been right there along with my side. 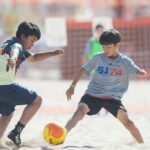 What has changed for you since starting to play beach soccer? 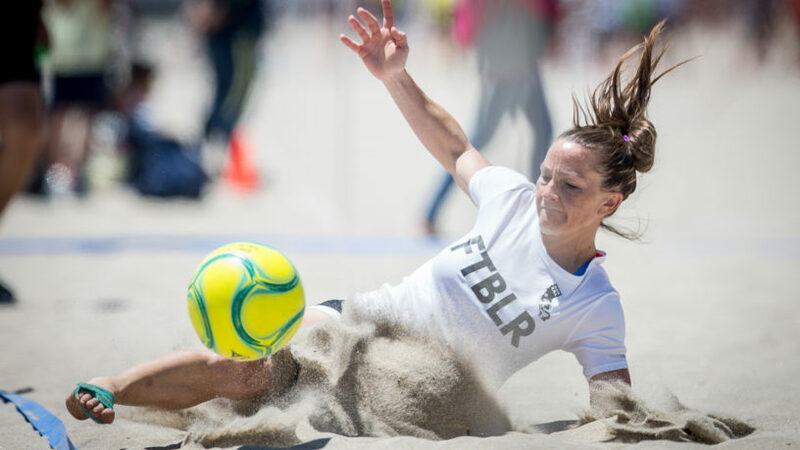 Since I have started playing beach soccer it has provided me with the gift of being faster, stronger, more agile, and honestly, I can jump higher than I have ever in my before. Did I mention I am 36 years old? But, still, it’s true. Beach Soccer has made me the best athlete I have ever been to. 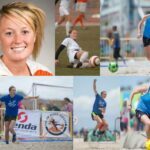 My touch is better, dealing with balls in the air, which I was always good at, but now at a level, I didn’t even know I could achieve, and whereas I know the OTF training is helping it really all comes down to playing and training in the sand. It has even given me the opportunity of being recognized in futsal. This year I was invited to play in the identification camp for the US Futsal National team. I would have never imagined this not only at my age but ever before starting this journey of beach soccer. It’s actually amazing as the national team coach for US Futsal is actually telling the other players to join us as they see both Meza and I performing skills which are very different than the rest of the team. The coach has stated we have those skills because we play beach soccer. 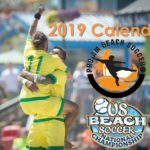 So, what’s next for you and beach soccer? Well, we keep being told the World Beach Games are coming to San Diego in October. 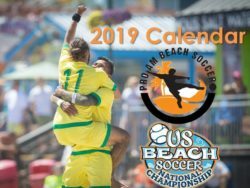 In addition, there is a tournament which is part of the US Beach Soccer National Championship Qualifier in Oceanside in May. 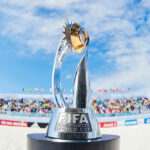 This is supposed to be a sort of “Confederations Cup” tournament to prepare the hosts for the beach games. National teams will be playing for men’s and women’s in preparation for the World Beach Games. We have heard from FIFA and sources hear the US is putting together the US Women’s National team since we are hosting the I.O.C. event. So, if I had my hopes and wish, I would be looking at continuing to train harder with my teammates in NorCal to get us ready to represent my country if given the chance! Representing my country would simply be another unimaginable opportunity if given the chance. I’m training for it, and I will be ready!